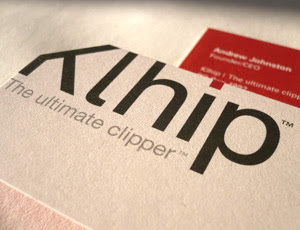 Design Hovie Studios, Inc., has designed the new brand identity and business papers for Klhip, the ultimate clipper. Idaho based Klhip is the designer of a streamlined revolutionary nail clipper that will be sold online and in boutiques and spas all over the world. For the new brand, Design Hovie Studios created a clean, bold look with a clipped K letterform to reflect the company's product. The business card further emphasizes this with die cut edge. The entire project was a 2 month process designed by Creative Director Hovie Hawk and designer Paula Vuncannon.